On your silvertracker.net home page hover your cursor over the Users tab and click Change Your Password.Enter your current (old) password and the new you would like to change it to – confirm and click "Change Password". NOTE: The user Password is case sensitive and must be entered as it was created and / or changed to. On your silvertracker.net home page hover your cursor over the Users tab and click Edit User, choose the user you wish to edit and click the blue “Reset Password” box at the bottom of their user profile. Type in the Password, confirm and click "Reset Password"
NOTE: Your user role in the Silvertrac system will determine your access and ability to change your Password or another users Password. For example; an officer’s user role does not allow access to the Silvertrac portal at all and therefore must have any changes to their Password done by an Authorized user such as an Admin, Supervisor or Dispatcher. 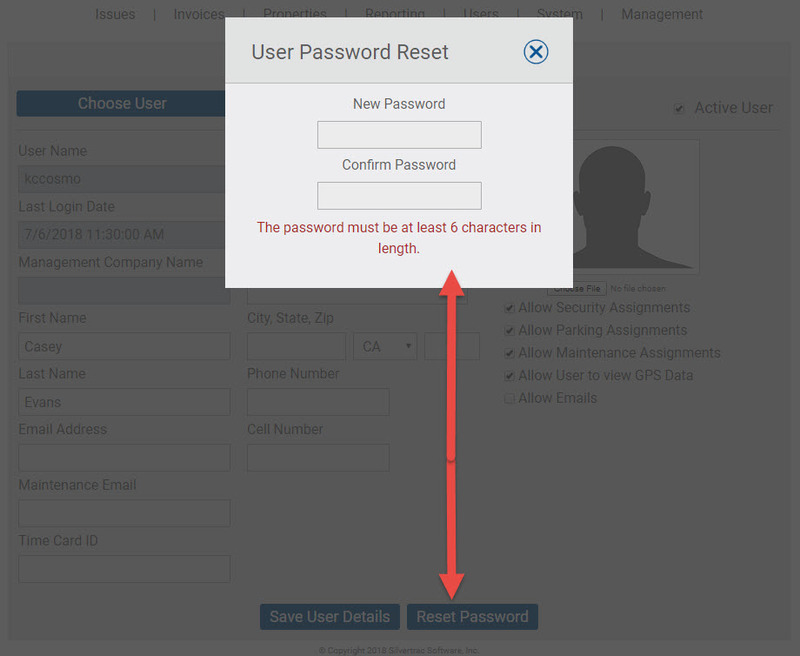 The system Admin can change any users Password with the exception of another Admin’s Password.